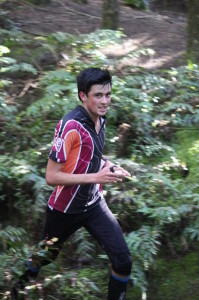 The WOA Middle Distance Championships were taken out by Tim Robertson on Monday, making it his 3rd win for the weekend. Robertson destroyed the field to win by almost 4 minutes, with a time of 27:33. 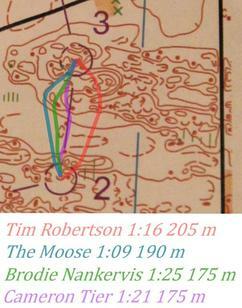 The Moose, who was caught 4 minutes by Robertson at control 14, kept attacking and finished before Robertson on 31:28. Brodie Nankervis of Australia claimed 3rd, and Cameron Tier 4th, with about a minute separating those three. Robertson executed a clean race with impressive speed to beat the estimated winning time by 2 and a half minutes. 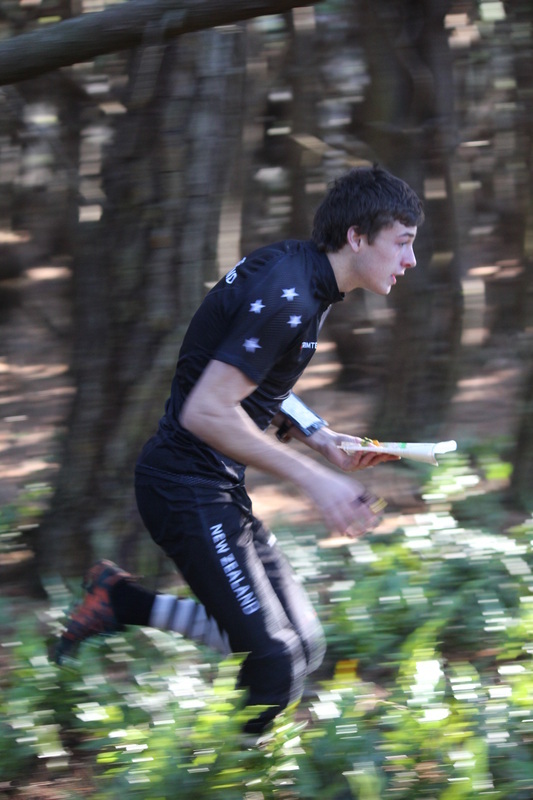 A run like this at JWOC is sure to place him very high on the results board, so look forward to some impressive times from him over in Bulgaria. The course started in classic inland Waitarere terrain. Vague to detailed contours with minimal undergrowth ensured fast running speeds. There was minimal route-choice here and any runners that drifted far off the line paid for their mistake in costly seconds. The course then zig-zagged its way back down the coastal block. The coastal block features a very complex dune-system with a mixture of macrocarpa forest, rough open vegetation and areas of very thick scrub. The navigation becomes a lot more difficult here and route-choice also comes in to play. Overall the top runners ran well through this part and many had relatively clean races. To the third control there was a lot of splitting for this short leg. Possibly due to bad exit directions, many of the runners ran very wide for no apparent reason. 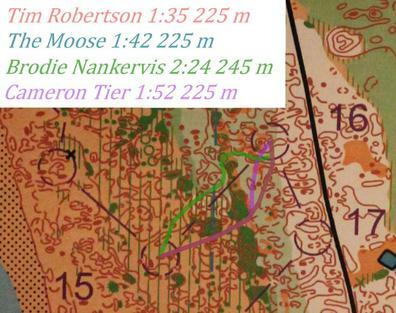 Robertson, who ran the furthest of the top 4 men on the course, lost some time here to The Moose, who took a shorter route. The 7th control, one of the simplest legs of the entire course, cost Cameron Tier a lot of time. Tier hit the wrong track but assumed it was the correct one, and ran close to 300 m in the wrong direction before realising. Tier almost ran double the length of the other runners here, possibly costing him 3rd place. The short leg to 12 running parallel to the road was interesting in terms of the route-choices taken by the runners. Nankervis, who opted to run wide to the open, lost some time here with the extra distance. Robertson, who achieved the quickest time on this leg, said of his route-choice “The boundary between the white and mint-green forest was really distinct in the terrain and I just followed this straight to the control”. Quickly re-evaluating route-choices during in the course can sometimes prove valuable for running the best way. The patches of thick vegetation that form the boundary between the macrocarpa forest and open dunes in the coastal block can create some difficult route-choices. Often the boundaries of these impenetrable thickets are difficult to make out so finding the narrow passages can be hard to follow. To the 16th, there was a degree of splitting amongst the top runners. Brodie aimed for a more direct route than the others but the green pushed him around, making him run further. 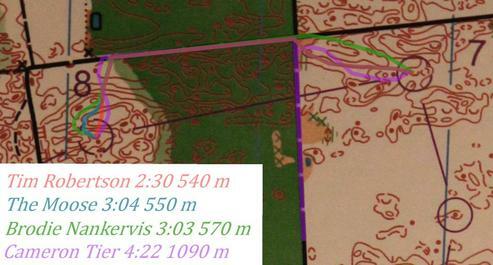 A bad direction into the control also cost him some time, meaning he lost between 30-50 seconds for this leg. It is good to see the newer members of the team stepping up to the top grades for competitions like WOA Champs. Running with some of the top runners gives them experience that they wouldn’t otherwise gain from running their natural grade. When they compete in Europe they will already be used to a higher level of competition and will take JWOC in their stride. Cameron Tier and Callum Herries put in some good orienteering in the Men’s Elite grade for the Sprint and Middle this weekend, along with Becky Gray, Kayla Fairbairn and Alice Tilley in the Women’s Elite grade. For now, the team members head back home for their final training in New Zealand before they head over to Europe. Many good performances by the team have hopefully inspired others and increased the excitement and anticipation of the results from New Zealand’s Bulgarian conquest. There is a gallery of photos of the JWOC Team members under the “Photos” section of this blog. in the JWOC Group on this site.